In its distribution centers – in Grude, Sarajevo, Banja Luka and Tuzla, Grafotisak held a presentation of the school program for the upcoming school season 2016/2017. All interested visitors and business partners during the visit could see in live the assortment for the new school season, as well as to get additionally informed about the exposed items. 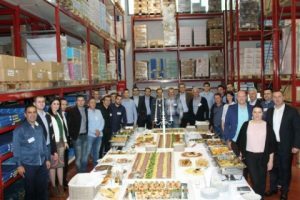 In all distribution centers, visitors have enjoyed in the pleasant company with food, drinks and sweets of the catering partners, and also took part in the rich prize game, whose drawing was by the end of the presentation. After the presentation, visitors have taken catalogue and the pricelist with the occasional gifts. Grafotisak wish to thank heartily to the all visitors on their coming and pleasant companionship.